Dansk Psykologisk Forlag, 9788771585865, 256pp. 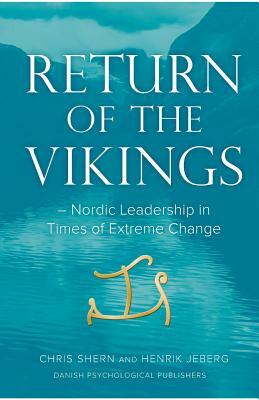 RETURN OF THE VIKINGS - NORDIC LEADERSHIP IN TIMES OF EXTREME CHANGE tells the story of the rich heritage of the Nordic peoples: as explorers, navigators, trendsetters, political and educational innovators. This provides deep roots, traced back to the Viking era and the nine noble virtues of Nordic mythology. And it still informs the way the Nordic peoples live and work today. "The methods, values and leadership practices of the Vikings are woven into the DNA of international businesses founded in the Nordics, and exemplified by many Nordic practitioners who work in other countries or for non-Nordic organizations. The inclusive, trusting, collaborative style of Nordic leadership offers an alternative way to negotiate through our current times of extreme change. What many of us are now experiencing online in distributed, fluid, networked communities, the Nordics have been practicing on land and sea for centuries. The Nordics are not waiting around to find out when the future begins. They are already leading the way" (passage from the book). "RETURN OF THE VIKINGS takes a timely and insightful look into the trust-based Nordic approach to leadership, its origins in the Viking era, and its relevance for a future marked by extreme change and uncertainty. An inspirational read told through the stories of others. " - Jan Carlzon, Former CEO for Scandinavian Airlines System and international best-selling author of Moments of Truth. The authors offer an intriguing perspective on the Nordic societies, their leadership style and way of doing business. Their own stories are interwoven with those of a diverse range of interviewees, including business executives, politicians, writers, designers, athletes, military personnel and entrepreneurs. CHRIS SHERN is a cultural adventurer. He has lived and worked internationally for over 20 years. He was employed by Scandinavian Airlines for many years in leadership roles across three continents. Currently, he is Managing Director of IME, a Danish business foundation specializing in executive education and leadership development.